protection from costly water damage. It’s easy to believe your business won’t experience leaky pipes or major plumbing failures, but it’s more common than you think. Thousands of businesses are damaged annually, expensive property and equipment are ruined and valuable time is lost. Millions of dollars are spent on recovery. 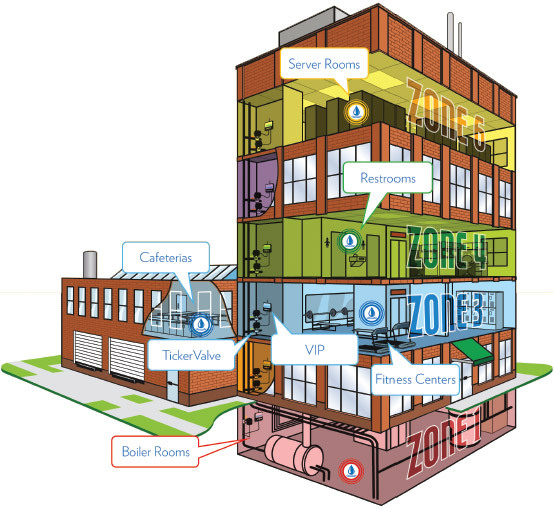 PipeBurst Pro offers the industry’s best protection from leaks for commercial buildings, with a system that automatically detects leaks and shuts off water sources. Today’s homes contain more water source points than ever before — leaving your residence vulnerable to potentially disastrous leaks. PipeBurst Pro can tailor a detection and shut-off system for your home to provide maximum protection. 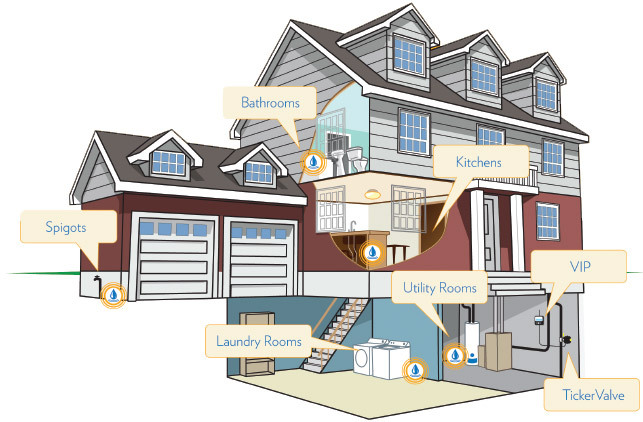 Place a sensor at the lowest point in your home, on each floor, or at every water source. Integrate into an existing security system for alerts while you’re away. 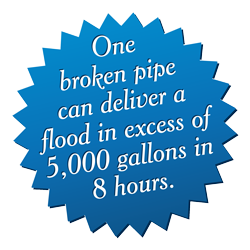 PipeBurst Po offers different levels of installation to protect what matters most. Will your home or business be flooded with problems when your pipes leak? Every year thousands of buildings, belongings, and assets are damaged by leaking water and burst pipes. Valuable time is lost and many thousands of dollars are spent on recovery and restoration. We have watched the news stories, heard first hand accounts from our friends and family, and wondered if at some point this very same thing would happen to us. Wouldn’t it be nice to know that you are protected? Imagine the peace of mind that would come with knowing that your family pictures, your kids’ handmade projects, and those irreplaceable family heirlooms will be safe for generations to come. As a business owner imagine knowing that your servers, electronic equipment, legal files, project archives, and valuable assets are safe from potential and costly water damage. If you are not thinking about this now you should be, before it’s too late. PipeBurst Pro is the most effective, highest-quality automatic flood detection and prevention system on the market. PipeBurst Pro gives you that peace of mind, knowing your home or business is protected whether you are there or not, 24 hours a day, 7 days a week, 365 days of the year. With outstanding customer service, the best warranty in the industry, and proudly made here in the USA, you can trust PipeBurst Pro to protect what matters most. Don’t risk another moment, contact us today to find out how you can have the protection of a PipeBurst Pro system in your home or business! Copyright © 2014 PipeBurst Pro. All rights reserved.